Do you buy candy for the holidays? If so, you are not alone. 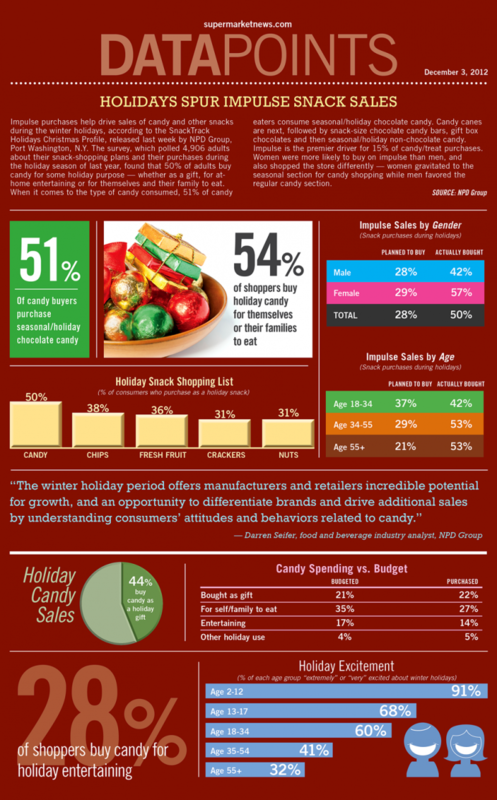 It turns out, that 54 percent of Americans purchase candy for themselves or their families to eat during the holidays. But 44 percent of the people surveyed also purchased candy as a gift. This information is from the infographic below. You'll see it breaks down impulse shopping habits by gender and age. The data is based on a survey by NPD group, which studied the shopping habits of 4,906 adults during the 2011 holiday season. One of the most interesting findings is that women buy more candy than men. The study also found that adults over 55 years of age make more impulse purchases than people who are between the ages of 18 to 34. See below for more fun facts on consumer spending habits during the holidays. by supermarketnews.Learn about data visualization tools.